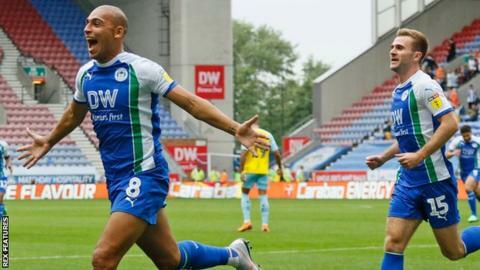 Wigan's James Vaughan scored the only goal as Rotherham suffered their third away defeat of the new season. Vaughan forced the ball home after goalkeeper Marek Rodak failed to hold Callum McManaman's initial effort. Rodak had earlier kept the Millers on level terms with a superb double stop to deny Callum Connolly and McManaman. Ryan Williams went close to an equaliser with a low effort from Kyle Vassell's cross, but Christian Walton made a fine fingertip save. Rotherham boss Paul Warne's plans were disrupted early when they lost defender Sean Raggett to injury, with Clark Robertson coming on his place. After Joe Mattock blocked a goalbound effort by Connolly, Josh Windass was only inches away from an opener for Wigan when his free-kick flew just wide of the top corner. Ryan Manning tested Walton with a 25-yard attempt just before the break and the keeper had to save again from Mattock's effort following a free-kick early in the second half. Substitute Vaughan, though, had the decisive say as he toe-poked the ball over the line and Wigan held out fairly comfortably for all three points. "It was certainly a hard-fought victory. "Rotherham made us work tirelessly for it, as we knew they would do. "But our lads dug in and we really earned the win." "I'm obviously biased, but I'm also honest and I thought we were the better side in the second half. "Against an excellent Wigan side, who played Stoke off the park last week, I'm proud of the effort and how we went toe to toe with them. "But at the same time I'm very disappointed to come away with nothing." Match ends, Wigan Athletic 1, Rotherham United 0. Second Half ends, Wigan Athletic 1, Rotherham United 0. Hand ball by James Vaughan (Wigan Athletic). Attempt blocked. Kyle Vassell (Rotherham United) left footed shot from the centre of the box is blocked. Assisted by Ryan Williams. Attempt missed. Clark Robertson (Rotherham United) header from the centre of the box is just a bit too high. Assisted by Ryan Manning. Attempt missed. Ryan Williams (Rotherham United) left footed shot from outside the box is too high following a set piece situation. Kyle Vassell (Rotherham United) wins a free kick on the left wing. Attempt blocked. Ryan Williams (Rotherham United) right footed shot from the centre of the box is blocked. Josh Windass (Wigan Athletic) wins a free kick in the defensive half. Attempt missed. Semi Ajayi (Rotherham United) header from the centre of the box is too high. Assisted by Ryan Manning with a cross following a corner. Corner, Rotherham United. Conceded by Cedric Kipre. Substitution, Rotherham United. Jamie Proctor replaces Richard Wood. Attempt blocked. Will Vaulks (Rotherham United) right footed shot from the centre of the box is blocked. Corner, Rotherham United. Conceded by Christian Walton. Attempt saved. Ryan Williams (Rotherham United) right footed shot from the centre of the box is saved in the bottom right corner. Goal! Wigan Athletic 1, Rotherham United 0. James Vaughan (Wigan Athletic) right footed shot from the centre of the box to the centre of the goal. Attempt saved. Callum McManaman (Wigan Athletic) right footed shot from the left side of the box is saved in the bottom right corner. Assisted by Josh Windass. Attempt saved. Clark Robertson (Rotherham United) header from the left side of the box is saved in the bottom left corner. Assisted by Ryan Manning with a cross. Attempt blocked. Kyle Vassell (Rotherham United) right footed shot from outside the box is blocked. Corner, Rotherham United. Conceded by Callum Connolly. Attempt missed. Will Vaulks (Rotherham United) left footed shot from the left side of the box is high and wide to the left following a corner. Corner, Rotherham United. Conceded by Lee Evans. Attempt blocked. Will Vaulks (Rotherham United) right footed shot from the right side of the box is blocked. Assisted by Michael Smith.